As someone who is obsessed with rainbows and unicorns…. 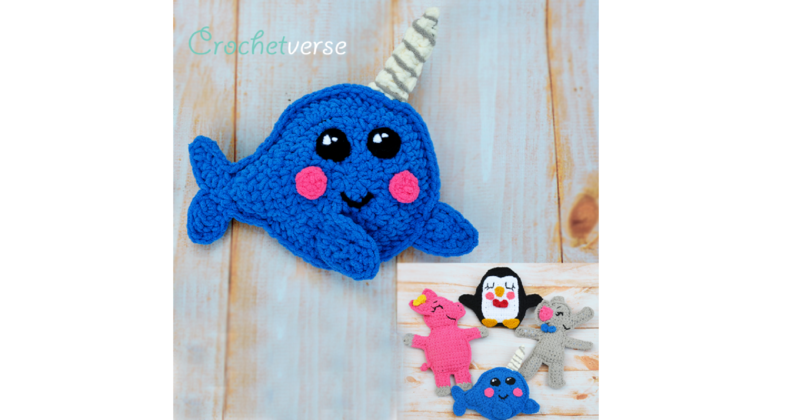 I kind of go by a “Have horn, will travel” kind of motto… SO of course the Narwhal fits the bill!! 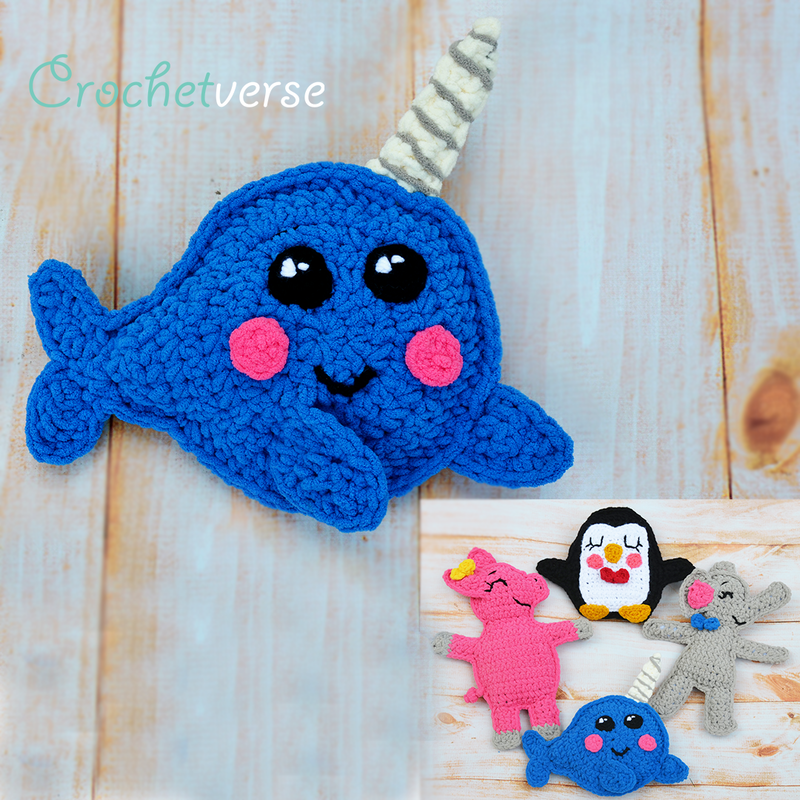 Today, I am expanding my FREE Ragdoll Pattern Menagerie with THIS little narwhal cutie! 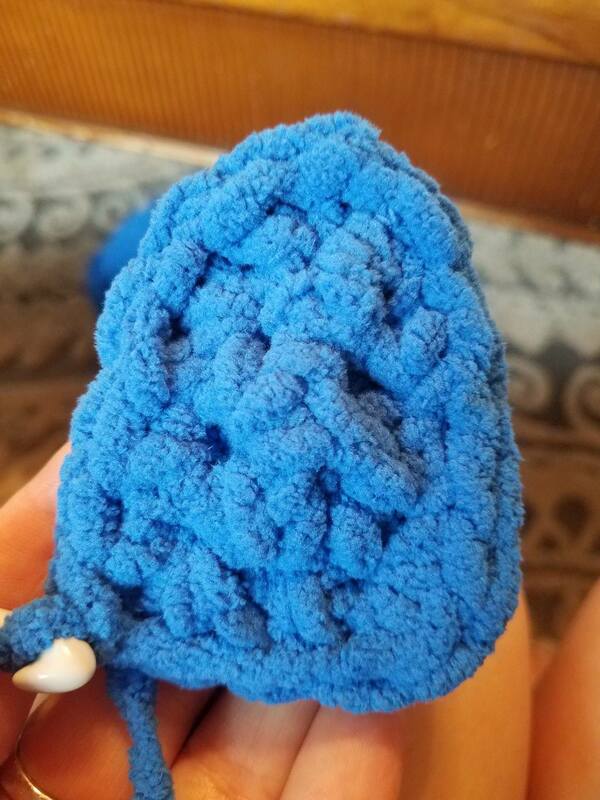 No blanket yarn? 3 strands of regular worsted weight yarn can be held as one to equal super bulky. Want a smaller doll? Reduce your hook and work double or single strand worsted weight, being sure to keep stitches tight. Not super important, but be certain you do not have gaps in your stitches where the stuffing will poke out. If this is occurring, choose a smaller hook size and try again. 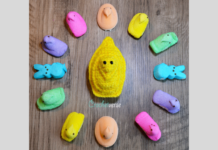 Row 12: (Create Tail) turn, ch 4, sc in 2nd ch from hook, hdc in nxt ch, 2 hdc in nxt ch, sl st in each of the 2 sts from row 11, ch 4 more, and turn again, sc in 2nd ch from the hook, hdc in the nxt ch, 2 hdc in the nxt ch, sl st into the sl st on row 11, tie off. Row 3: ch 1, turn, sc dec over the 2 sts, ch 1, then tie off. Stack 2 fin pieces on top of each other matched. As you work the join round, tuck the tails inside the piece to stuff and eliminate the need to weave in ends. 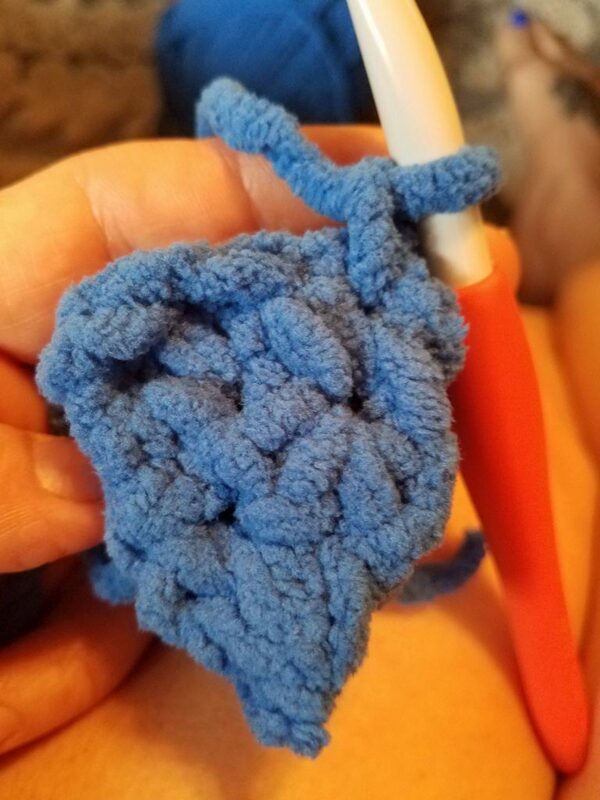 Insert hook through BOTH pieces in the 1st st made on row 1 and join blue yarn with a sl st, ch 1. Rnd 1: working through both panels, matching stitches, make 3 sc in the same st as the join, sc in the nxt st, 3 sc in the last st, sc in each of the 3 row ends up the side, sc in through the st on row 3, ch 1, then sc in the same st on the fin, sc in each of the 3 row ends down the 2nd side, sl st to the 1st sc made, leave a long tail to seam to body. Lay the 2 main body panels on top of each other, matching stitches. Rnd 1: working through both panels, matching stitches, sc in each st around, at the st at the tips of each fin make (sc, ch 1, sc) all in the same st, and at the low point between the 2 fins, replace the sc with a sl st. Tuck tails inside as you work around, before the last few stitches are worked, stuff a small amount of stuffing inside. You want your piece to have SOME body, but not be overly stuffed because it is a ragdoll. I did not find a need to work any increases on the join round, the body remained fairly flat. The image above shows the location where the (sc, ch 1, sc) are worked at the tail tips and where the sl st at the point is worked. Row 6: ch 1, turn, sc in the st, ch 1, tie off. Stack the 2 horn pieces on top of each other matched with the sides that have the ridges created by the blo/flo stitches facing out. As you work the join round, tuck the tails inside the piece to stuff and eliminate the need to weave in ends. Rnd 1: Working through BOTH pieces at once to join, make 2 sc in each of the 2 sts across row 1 on the bottom, 1 sc in the end of each of the 7 rows up the side, in the sc at the top of row 7 make (sc, ch 2, sl st in 1st ch of the ch-2 made, sc) all in the same st, sc once in the side of each of the 7 rows down the 2nd long side, sl st to the 1st sc made, tie off, leave a long tail to seam to body. Rnd 1: make 6 sc in the ring, sl st to 1st sc made, tie off leaving a long tail to seam to face later. Do not turn or join rounds unless instructed. Seam on fins: using the main photo as a guide and the long tail left after tying off, stitch one fin to the body and one from the side. Try to match the position as shown in the image. I like the side of the body with the right side of the join round facing up to be the right side of my piece. Same for the fins, seam them on so the right side of the join round is facing up. The fin from the side of the body should be seamed BEHIND the join round. 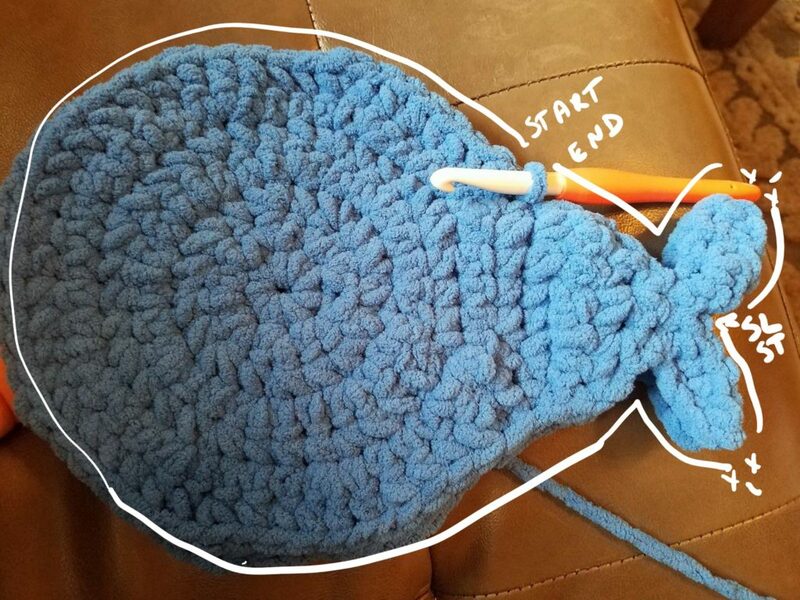 The fin on the body should have one stitch worked in the center to the main body. This way it is still free floating but tacked into position. Seam on horn: using the main photo as a guide and the long tail left after tying off, stitch the horn to the top of the head, behind the join round of the main body and angled so it points slightly forward. Be sure the right side of the horn join round faces front. Seam on cheeks: using the main photo as a guide and the long tail left after tying off, stitch on the cheek circles making sure the right side of round 1 of the cheek is facing up. 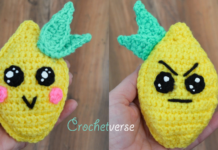 Seam on eyes: with a strand of white, 1st stitch on the eye sparkles as shown in the main pattern image. 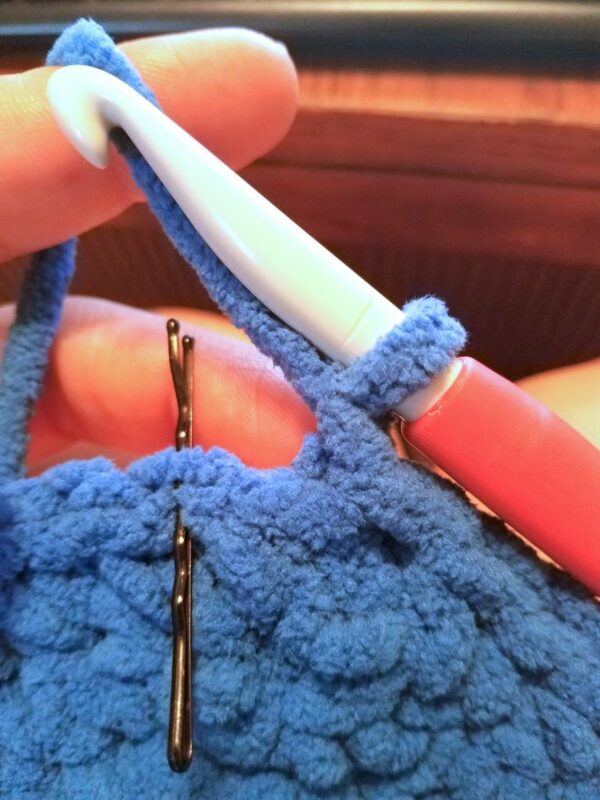 For the larger main dot, work around the stitches 6 times, for the smaller one just work around twice. 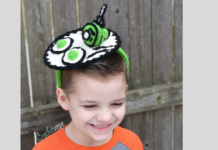 Stitch the eyes so that both main dots face up in the same direction and are placed so the large white dot is in about the 11 o’clock position for both eyes. Stitch on mouth: with a single strand of black worsted weight yarn, use the photo as a guide and stitch on a little mouth. Enhance horn: (optional) using a strand of gray, wrap it round the hook tugging gently to make it appear the horn is spiraling. Stitch on eyebrows: usin a strand of black single and needle, stitch eyebrows on using the photo as guide working around twice. Next articleCrochet Boho Purse – Tie Dye How-To!